Comments When one talks of Coral talisman for Mars, it is the ruddiest of reds that come to the mind. This Coral used for making jewellery or talismans – the ‘corallium rubrum’ (the red coral from Sardinia, Italy/ Italian red coral) and ‘corallium japonicum’ (Red Coral from the Pacific Ocean off the coast of Japan/ Japanese Red Coral) is very different from the protected species. Featured today is a natural and organic Japanese Red Coral of 4.96 carats set in 22 karat gold as a Mars Talisman ring with the symbol of Mars in relief on the shanks. The oblong Oval cabochon has a smooth, blemish free surface. 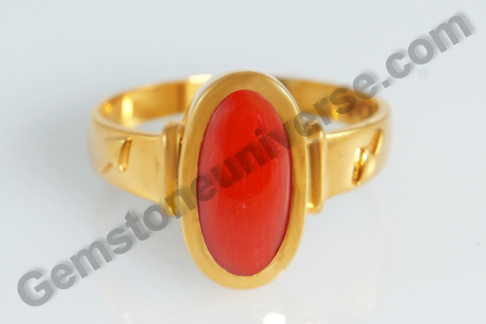 The color of the gem is a rich Mediterranean Ox- blood color and has a good jyotish weight. Corals are skeletal remains of marine polyps. They are mainly composed of Calcium Carbonate. 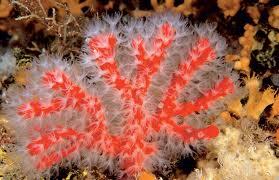 It gets it color from the single celled algae called zooxanthellae that its shares a symbiotic relationship with. 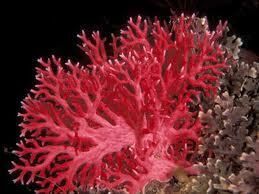 Several million zooxanthellae live in just one square inch of coral. Coral polyps and their skeletons are actually clear or white and it is pigment in the zooxanthellae that gives coral more than 90% of its colorful hues. Unprocessed Coral is matt and is polished to a smooth shiny finished surface. According to Vedic Astrology, Red Coral or Moonga is the gemstone of the planet Mars also known as Mangal, Kuja or Angaraka in the Hindu Mythology. Comments It is a pleasing green – this emerald. A green lovely and soothing – a shot of exuberant, flourishing life in the vast dreariness of monotony and mundaneness. Featured today is a lovely natural Zambian emerald of 2.69 carats, characterized by the deep natural green color set in 22 karat gold as a men’s emerald ring. The oval gem has a fair weight and vivid color. Zambian emeralds are marked by their deep green color as the crystal of this emerald is green through and through, unlike the Colombian emerald with its bluish green sparkly appeal. Zambian emeralds have their own fan following. Zambian emeralds are known to be relatively less porous and slightly harder than other varieties of emeralds so the scope of unethical practices of gem treatment like fracture filling gets greatly reduced. Emerald, also known as panna is the gemstone of Mercury or Budha in Vedic Astrology and a natural emerald is used to harness the energies of this planet. Mercury is also known as Hermes in Roman Mythology, where he is the sharp but the naughty one – restless in manner! No wonder people dominated by the influence of this planet display similar traits. 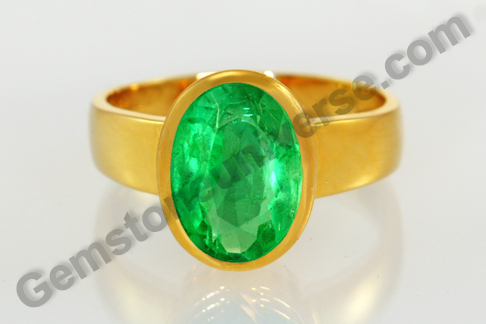 To view natural emerald prices and inventory click here. Comments The rarest of rare gems. Organic, natural and pure Basra Pearl – once the toast of royal circles, now has become a real rarity. Featured today is a fully, natural, certified, organic Basra Pearl of 2.59 carats from the Persian Gulf set in Sterling silver as a ladies natural pearl ring. This Basra pearl is a real beauty in button shape with a faint light cream tone. The gemstone comes with a radiography report and a certificate from a state of the art gem testing lab in Bahrain – the only nation where trading of cultured pearls is illegal! Basra pearls are legendary for their value, effect as well as power. 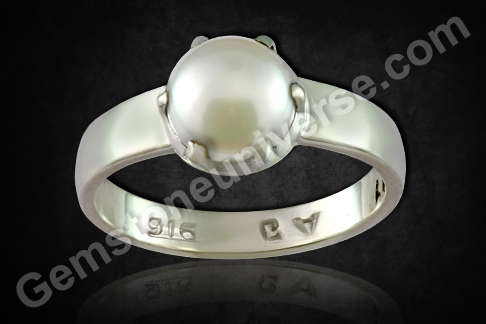 Natural Pearl is the gemstone of planet Moon/ Chandra and is used to harness its calm and gentle energies. Basra pearl/ Basra moti has been used for ages to harness saatvik moon energies. Basra pearls became a rarity due to two reasons – the artificially cultured pearls flooded the markets at a much lesser rate than the actual Basra pearl cost and secondly as the oil boom in the Middle East shifted the focus away from the pearls. 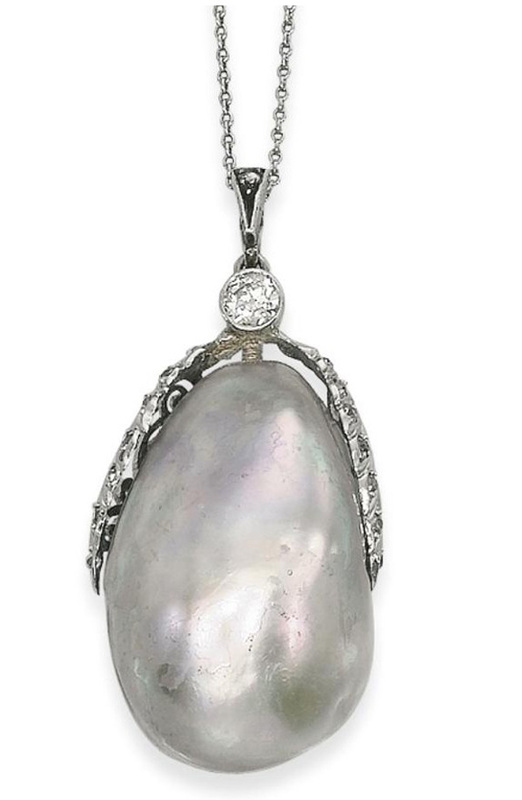 Take a look at this Giant Dubai Natural Pearl (well, of course from the Persian Gulf) which went under the hammer at Christie’s in Dubai in April 2011 and fetched $ 2,54,500! It is one of the world’s largest natural pearls at 59. 92 carats, is drop-shaped and mounted as a pendant on a diamond -studded chain necklace. To read more about Basra Pearls, click here. To see the natural, Basra pearl price and inventory click here. Note: Thank You Dear Patron for the gracious testimonial. Comments The Ceylon Yellow Sapphire is legendary and is famed for its great quality and gem attributes. A good quality natural yellow sapphire is clear, lustrous and has great color. Featured today is a lovely natural Ceylon Yellow Sapphire of 3.50 carats set in 22 karat gold as a ladies yellow sapphire ring. The oval cut gem is a pleasing light butter yellow color and has superb clarity and lustre. The Ceylon yellow sapphires, especially from the Ratnapura mines are regarded as the world’s finest. Yellow sapphire or Pukhraj is the gemstone of Jupiter or Brihaspati/ Guru and is used to harness its powerful and benevolent energies. The yellow sapphire is believed to help greatly in helping with ethical dilemmas, spiritual growth and even in ensuring material wealth and prosperity. 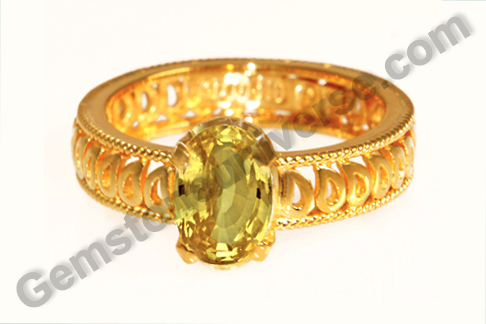 Most of the yellow sapphires in the market today have been heat treated to enhance their color. Natural yellow sapphire with good color is therefore a rarity and commands a premium price. To view the yellow sapphire price and inventory click here. 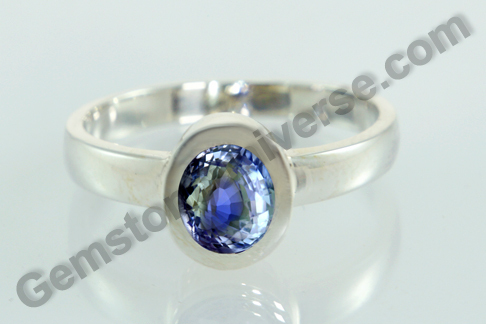 Comments The Blue Sapphire is a gemstone that is one of the best gifts of nature. The sheer range of colors that it comes in, and with each gem exuding individual energy and charisma makes the Blue sapphire even more interesting. Featured today is a fully natural, unheated, untreated Ceylon Blue Sapphire of 2.37 carats set in Sterling Silver as a Saturn Talisman ring. This sapphire is a lovely blue with violet overtones. The faceting is very appealing and interesting, giving an edge to the lustre and brilliance. Natural Blue Sapphire is the gemstone of Lord Saturn/ Shanidev according to the ancient science of jyotish/ Vedic Astrology. The power of Blue sapphire or the neelam gemstone is dramatic and is used to harness the powerful transformative energies of the planet Saturn. Saturn is a karmic planet and its planetary periods spell retribution and imparting of karmic lessons as well. An individual must wear a Blue sapphire for benefits if it is favorably posited in one’s birth chart, especially if one is going through Saturn’s sade sati (seven and half year cycle) or the Saturn’s dhaiyya (two and half year planetary period). Comments The Cat’s eye gemstone has been an enigma of sorts for years. The powerful and mystical energies of this phenomenal gem have intrigued people for a very long time. Featured today is a very fine fully natural Chrysoberyl cat’s eye of 3.85 carats from Sri Lanka set in 22 karat gold as a Ketu Talisman ring. The cat’s eye is translucent and a lovely greenish gold in color. The well cut cabochon has a sharp chatoyant band running across its length. Ketu is also known as the Lunar south Node or the South Node of the Moon. He is represented as the headless lower half of the body of the serpent. 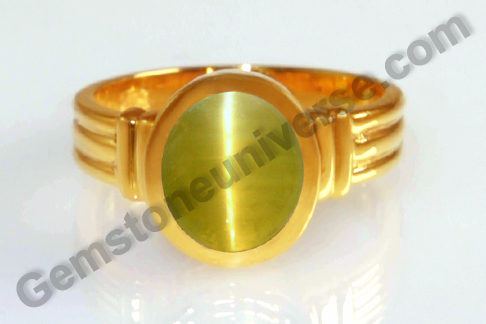 Chrysoberyl cat’s eye is the gemstone of Ketu and is used to harness its energies. Cat’s eye is also known as lehsunia, vaidurya or bidalaksh in Hindi. 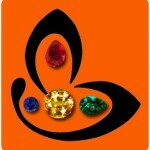 The best of cat’s eye gemstone comes from Sri Lanka, Brazil and Madagascar. A person going through the dasha of Ketu, (if it is favorably placed in the horoscope), should wear a natural chrysoberyl cat’s eye. It should also be worn by individuals who have Ketu posited in the Ascendant in their birth chart/ horoscope. To read more about cat’s eye gemstone click here. Comments There is the purity and the sparkle of a mountain stream and there is the razzle-dazzle of luxury and finesse. Featured today is a super premium gem – the rare natural white sapphire. This mesmerizing Sri Lankan natural White Sapphire of 5.12 carats has been set white gold as a men’s ring. 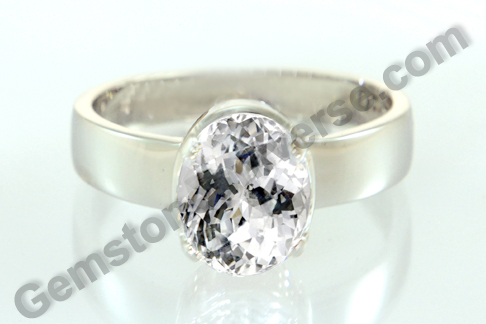 This oval shaped white sapphire is a flawless beauty. The gem has excellent clarity, enchanting brilliance and lustre and is a mammoth jyotish weight of 5.12 carats. White sapphire also refered to sometimes as the colorless sapphire, is the gemstone for Shukra or Venus. 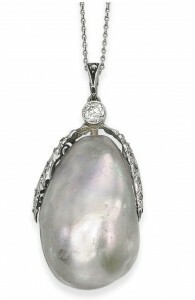 This gem is the ideal for Venus talisman as even women can wear it without any second thoughts (There is usually a tussle – white sapphire vs diamond, in the mind of individuals as due to another school of thought which suggests that women folk should not wear diamonds/ vajramani, which is generally regarded as the gem for Shukra). White sapphires are extremely rare occurring in nature as presence of some trace elements usually imparts color to the sapphire. This is one gem that promises to beget the best results from Venus – the planet of love, sensuality, beauty and luxury. Comments Color is an element that grips an individual’s fancy like none other. And in the case of colored gems it is this very element that makes a compelling appeal. 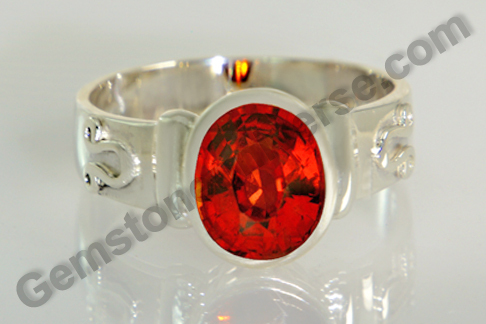 Featured today is a splendid hessonite garnet of 3.73 carats from Sri Lanka set in sterling silver as a Rahu Talisman ring. The gem is eye clean, lustrous and the color is a fine deep Orange Brown – the coveted burnt cinnamon color in hessonite. The interaction of light with the gem also produces a fire like effect in its belly giving it a distinction among gems. Note that the symbol of Rahu stands in relief on the shanks of the ring. Rahu is also known as the North Node of the Moon or the North Lunar Node and Hessonite garnet is Rahu’s gemstone used to harness its energies in a positive manner. Rahu is a karmic planet and its effects can be quite a bit for an individual to deal with. The Mahadasha of Rahu lasts for 18 long years and that makes it all the more important to pacify this planet by wearing a jyotish quality hessonite garnet. This, however, must be done after proper astrological analysis of one’s birth chart only, ascertaining if the gem would be suited. Hessonite is also known as Gomeda, Gomedha or Gomedhaka in Hindi. It is also known as the cinnamon stone. Among the metaphysical properties of Hessonite the sparking of creativity, desire to do justice to one’s abilities without losing touch with reality and dropping all unnecessary emotional baggage stand out particularly. Dear Patrons, in keeping with our promise to provide you a virtual treat, here’s the best in series. Enjoy the lux appeal and the scintillating glory of this new lot of Imperial Golden Yellow Topaz – Kanakdhara 2012– a stream of Gold as it has been named aptly. Just looking at these gemstones heal you and delight you! Greatly powerful and benevolent energies of Jupiter condensed into these little miracle packets! There is a certain palpable fire in their belly – golden warmth that promises good tidings. The best and the very rare Imperial topaz, meeting the Jyotish criteria, sourced from the mines of Brazil is now available to you. – The most favoured colour of deep golden brown, which actually the characteristic colour of Imperial topaz mined and found only in Brazil. – Natural, untreated, unheated gemstones with amazing levels of clarity, so much so that finding them became an uphill task. The gem markets have a glut of heat treated and beautiful appearing pieces. Those however, have no use and no effectiveness in planetary gem therapy. – Price — Despite the difficulty in sourcing it and rarity of these goods, the price point on Gemstoneuniverse site remains extremely affordable. We bring real value and goodwill to the clients. – The actual substitute gem for Jupiter is Imperial Yellow topaz. Please be guarded against using other stones like Citrine, which are almost in all cases heat treated and do not show any results. More information about why Citrine is a poor Yellow Sapphire alternative can be accessed by clicking here. – Guaranteed powerful Saatvik Results as all pieces of “Kanakdhara 2012’ are free from any doshas listed in the Shastras provided they are indicated in the chart. Representing the best in Gemstones they will deliver powerful results in Vedic Gem Therapy. Certification and Appraisal for this lot is complete and these will be made available to Gemstoneuniverse patrons in this week itself. February 2012 Special-New Lot of Super Premium Blue Moonstones-Soma 2012, radiating serenity and self assuredness of divine Moon energies for Gemstoneuniverse patrons. Dear Patrons, we bring you more and isn’t it merrier! Take a Luna ride into the night sky and enjoy its different shades. All you need is a willingness to go for a fantasy ride as you traverse the canopy of night on the wings of imagination. Presenting the new lot – ‘Soma 2012’ of the ever so much in demand gemstone – the blue Moonstone. These translucent cabochon lovelies are absolutely endearing with their domes displaying amazing adularescence. The Blue sheen known as the ‘Schiller’ in technical jargon is what makes it distinct from the amazingly large number of varieties that the moonstone comes in! The Schiller or this effect of light appears to move as the gemstone is moved under a source of light, revealing several hues. It is akin to seeing the magic of moonlight bouncing on water. These lovelies are one of the best treasures of India. There are several lores about the magical and intuition enhancing effects of the Blue Moonstone. – Good translucence, with a lovely blue Schiller – the true blue Moonstone. Check these lovelies and appreciate how we choose each Gem with love and attention to detail. – Fully Natural and untreated gemstone. – Price — it’s a steal. You don’t believe us? Do check out prices of such good quality Blue moonstone elsewhere and it wont be surprising to see you happily purchasing it. – Substitute gem for harnessing divine Moon energies. Moon is the karaka for mind. If you have been advised to wear a gem for moon, do the therapy as soon as possible. It will definitely show positive results in every aspect of your life. – Guaranteed powerful Saatvik Results as all pieces of “Soma 2012’ are free from any doshas listed in the Shastras provided they are indicated in the chart. Representing the best in Gemstones they will deliver powerful results in Vedic Gem Therapy. – Fully free from any enhancing treatment.